When one thinks of shrimp, nutrition is not generally the first thing that comes to mind. Considered to be a sort of delicacy, this shellfish actually possesses a variety of health and nutritional benefits. Though they are small in size, shrimp are enormous in the key vitamins and nutrients each one contains. Shrimp is admittedly high in cholesterol. Studies on shrimp nutrition have revealed that its consumption results in elevated LDL (bad cholesterol) levels, but, at the same time, raises HDL (good cholesterol) levels even higher, which actually serves to counteract any possible adverse health effects. Delayed allergic reactions may include headache, insomnia, constipation, diarrhea and/or depression. If any of these symptoms occur after eating shrimp or any other shellfish, medical attention should be sought immediately. 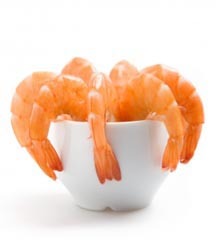 Shrimp nutrition facts show that it tends to be high in purines, which contribute to the development of gout and kidney stones. Persons with a sensitivity to purines should significantly limit or outright avoid shrimp consumption. Shrimp with an ammonia smell or those with discolored shells should never be eaten, as each is a sign of spoiling, which can lead to serious health trauma if consumed. When possible, shrimp should only be purchased when it is fresh and has yet to be frozen. However, when frozen shrimp is all that is available, consumers should be careful to spot discolorations in the flesh of the shrimp, which may be a sign of freezer burn. Overall, due to its high vitamin and mineral content, shrimp nutrition is recommended for those who are able to enjoy its beneficial health support. Providing more than 80 different nutrients, as much as 28.2 percent of the daily requirement for B12 and as much as 14.8 percent of the daily recommendation for protective fats, shrimp nutrition facts place this food source on the high end of the list of the earth’s healthiest natural foods.